Our youngest son spent spring break a bit differently than he probably anticipated. He came home looking forward to relaxing and he did get the chance to rest over the weekend. But on Monday and Tuesday we woke up early and “staged” the house for showing, then vacated to allow for potential buyers to tour throughout the day and into the evening. The work paid off and on Tuesday afternoon we received word we had a good offer. In fact, by Tuesday evening, our realtor had put together a list of offers we received. Wednesday morning, much to our son’s delight, we accepted one of the offers and cancelled all future scheduled showing appointments. We had an additional request for our son. During the rest of the week he helped to pack out his bedroom and before he left, turn over his house key. Next time he comes home to visit, it won’t be in this house. He’s an easy going young man, so he’s not troubled by the idea. When I asked how he felt about it, he shrugged and said we’ve moved before. Thankfully, due to our home stager, we’ve had a head start on packing and moving things to the storage units we’ve rented. We close in a couple of weeks and have to move out by the end of the month. We plan to stay in our camper while the house is finished (some of the work we plan to do ourselves). 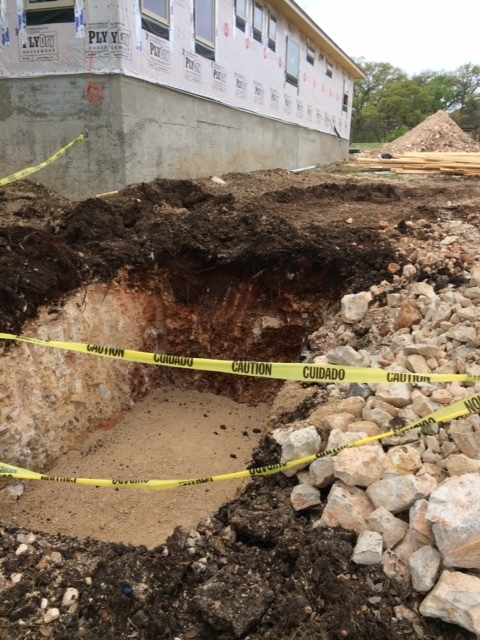 This past week, Paul Swoyer dug out the hole for our septic and our gas. 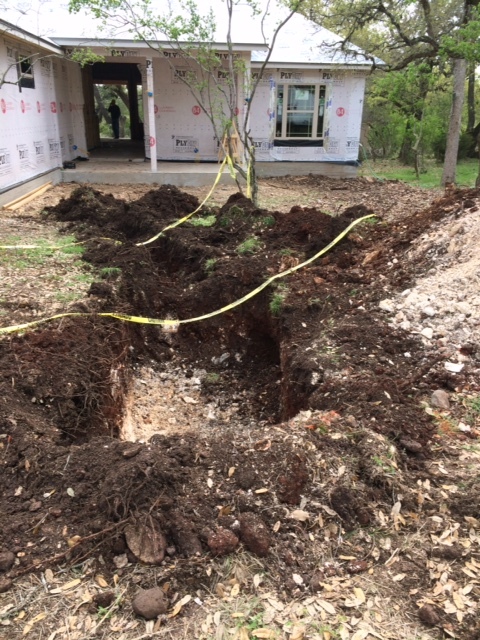 Unfortunately, the septic hole and future trenching for the “stinklers” will disturb and disrupt my prayer path and I’ll need to make some repairs. Our to-do list continues to grow as we juggle the tasks of moving out and the increasing work of the new house. Have I mentioned before how grateful I am for Sundays? In the midst of the busyness, it’s good to stop, rest and catch our breaths. 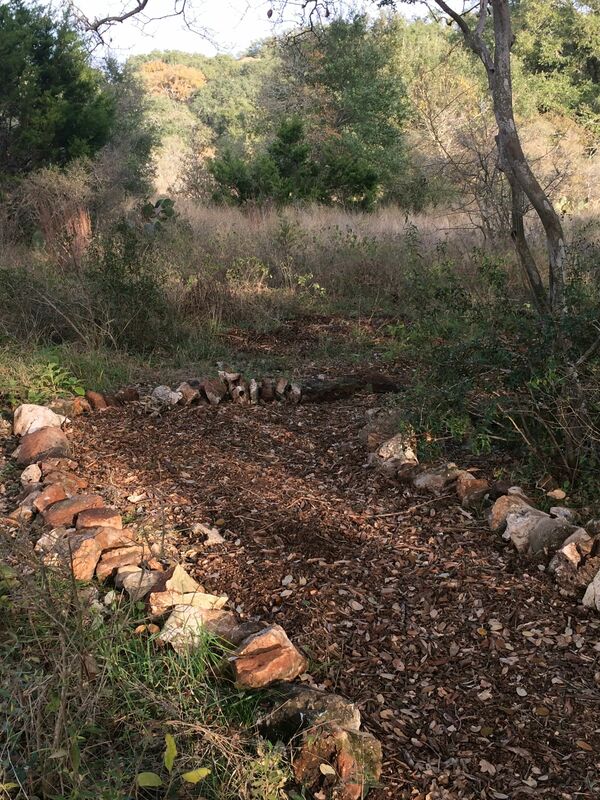 This entry was posted in Hill Country Living and tagged Country Living, Paul Swoyer, River Chase, Texas Hilll Country. Bookmark the permalink. It’s coming along so beautifully!